One way to make your Microsoft Word documents more professional is to use the Header and Footers to include information that helps the reader. Today, I'll show you how to add some useful information to the header/footer areas. What you put in the header and footer can be used to remind the reader of what their reading and also to guide them through the document, especially with business proposals and marketing plans. Something I've found very useful is to add the Chapter title to the footer. As the reader moves from one chapter to the next, the header or footer is updated dynamically. It’s a small point but it looks well. It also reinforces to the reader that you know how to prepare a professional-looking business document. 2. On the View menu on the main toolbar, click Header and Footer. If you can't see this, click the small arrows at the end of the menu to show this option. They may be hidden by Word. 3. Click inside the header or footer that you want to change. [Optional] On the Header and Footer toolbar, click ‘Same as Previous’ to break the connection between the header and footer in the current section and the previous section. 4. On the Insert menu, click Reference, and then click Cross-reference. 5. In the Reference type box, click Heading. 6. 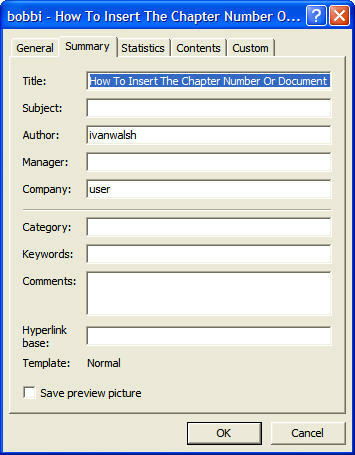 In the For which heading box, select the heading that contains the chapter number or title. In this example, it was My Book Title. 7. 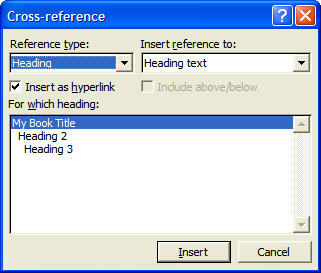 In the Insert reference to box, select what you want to insert in the header or footer. Click Heading number to insert the chapter number, and then click Insert. Click Heading text to insert the chapter heading, and then click Insert. This adds the document name to the header or footer. How to Update Headers and Footers? If you want to change the document title, update it in File, Properties and then open the footer again. 1. Click on the field you want to update. 2. Right-click and then select Update Field. Why Format Microsoft Word Docs? Think of it from the reader’s perspective. You get a business proposal, white paper, or marketing plan that you’ve been waiting for and… it looks terrible. The content may be fine but… why is the layout so poor, why didn’t they make more effort, why are the fonts different throughout the document? Over the next few weeks, I'll show you how to improve the appearance of your business documents. As most readers use Microsoft Word 2003, these steps will apply to this version of Word. If there is any confusion, please let me know.